Jeffrey Friedl's Blog » Quiz: What am I? I took the photo above this afternoon. What is it? A fountain head in a concrete walkway. I should add one hint: it’s practical, not ornamental. First thought was a fountain too… but the center bit looks more optical. Daylight photo sensor to turn on/off something else? IR sensor for counting cars in a road? Spray nozzle in a fountain. I am not sure of the actual name of it, however it is used for the poles that are seen in ticketing or amusement park lines. An access port of some kind? Underwater light in the hot springs? My guess is that you sold your house and bought that Hubble-esque Sigma APO 200-500mm lens and a custom 2x converter. Then you stood on your balcony and took a photo of a space ship which had landed on Mars. I agree with ShaneP. It is a kind of base to put on a pole, used in parking places. I thought I’d write up the answer in a post this evening, but it’s too late, so for now I’ll just leave another hint or two. Don and others who thought “fountain” are partially correct in that it does involve a squirting liquid. JasonP is partially correct in that it has a sensor of some kind. And here’s the big hint: Don and Jason are both on to something when they mention “walkway” and “road”. It has nothing to do with parking-lot poles or “rotating stone thingies”. 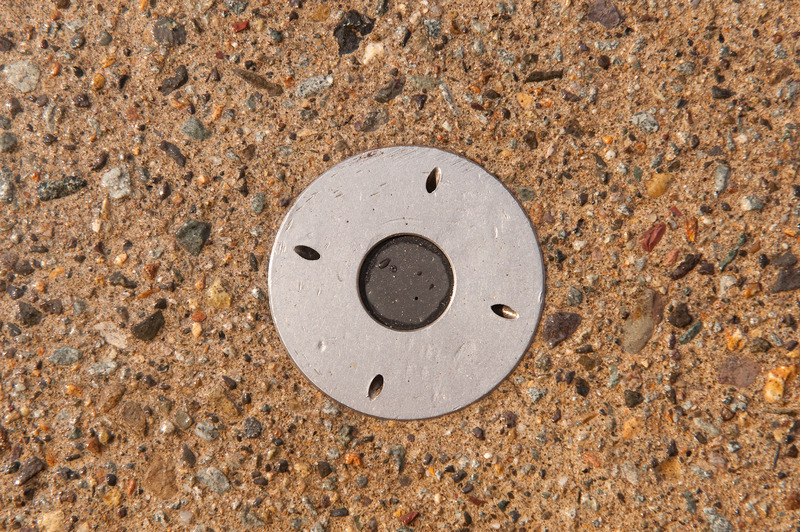 Think it is something like a sensor for rain or cold, with four nozzle to spray road or path with saltwater / just water ? Just an idea…. Was about to comment that it looked like one of the sprays that are used to keep minor roads clear of ice/snow in winter, but Fred Klee beat me to it. Most effective when the water coming out is warm, as in surplus water from a hot spring (onsen), of which there seem to be plenty in the area – map is more useful than satellite view in this case. The answer can be found on this post.